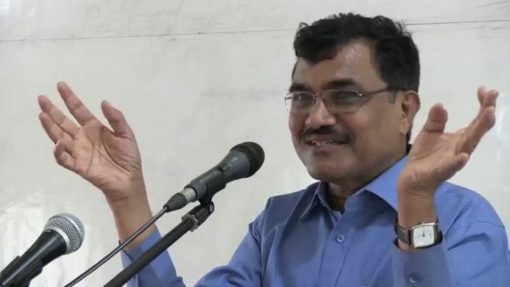 Submitting sealed envelope of new “evidence” in the court – to support the claim that Anand Teltumbde is a member of the banned organisation CPI (Maoist) – Pune police has sought his custody under Unlawful Activities (Prevention) Act (UAPA). The police also alleged for the first time in the court that the person 'Milind' referred to in various letters in the ongoing investigation is Milind Teltumbade, brother of Dalit scholar Anand Teltumbde. Though Anand himself has refuted the allegation, the police tried to emphasise this link in the court during the hearing. Pune Sessions Court, where the case is being heard, will give its verdict on the bail application of Anand Teltumbde on Friday. Earlier, the Supreme Court had asked Professor Teltumbde to apply for regular bail in an appropriate lower court, in Bhima Koregaon and other related cases. He had claimed that he is being falsely implicated by the state government in this case. His lawyer Rohan Nahar claimed that the scathing articles written by Teltumbde after Bhima Koregaon violence on January 1, 2018 had angered the state government. "This anger has kicked the malicious case against Anand. The police, which calls the case very serious in nature, flashes the evidences in the press conference, but do not submit them before court. They not even once asked Anand to come for investigation. This shows that the only purpose of this case is defamation of him," Nahar had argued on Wednesday. Nahar also argued that the police’s claim – that the name, 'Anand T', was found in the letters allegedly written by members of the Maoist organisations – does not have any strong evidence for substantiation. "This is inference of investigation officer that Anand T is actually Anand Teltumbde. Neither Teltumbde himself has written any letter, nor the police have produced the letters that are actually mentioning him. Police’s inference can't be taken as proof,” he told the court. Arguing against the bail application of Teltumbde, Special Public Prosecutor Ujjwala Pawar submitted the sealed envelope to the court. "These papers will clear that Anand T is actually Anand Teltumbde. There are letters mentioning him as 'Comrade Anand' too. That person is also Anand Teltumbde," police claimed. "Milind is a member of the banned CPI (Maoist) organisation, and so is Anand. Both brothers have addressed letters to each other, and those letters are now seized by the investigation officers. Those letters have actually cleared that Anand is in touch of many suspected people in the case, who wished to wage a war against the nation, wished to conspire against the law and order of the state," said Pawar. "Had not bail application been maintainable in this case, SC wouldn't have given this permission to approach a lower court," argued Nahar. Police, while seeking custody of Teltumbde, also told to court that he has also received Rs 90,000 from the Central Committee of CPI (Maoist). "Central Committee's letters seized during investigation show that Rs 10 lakh were kept for these people for different purposes, including for arranging a programme on the eve of the 50th anniversary of Naxalbari movement. Anand was also given a task to find and provoke students who could be later used for the Naxal activities," claimed police in the court. Teltumbde, in his bail plea, has said that his visit to Paris for participating in a conference of the American University of Paris was funded by the institution itself. But police on Thursday claimed that they have found the letters in which the Central Committee of CPI (Maoist) had arranged this lecture by using their contacts in Paris. Session Court concluded the hearing on Thursday evening. SC had given a period of four weeks to seek bail to Teltumbde, which lapses on February 14.